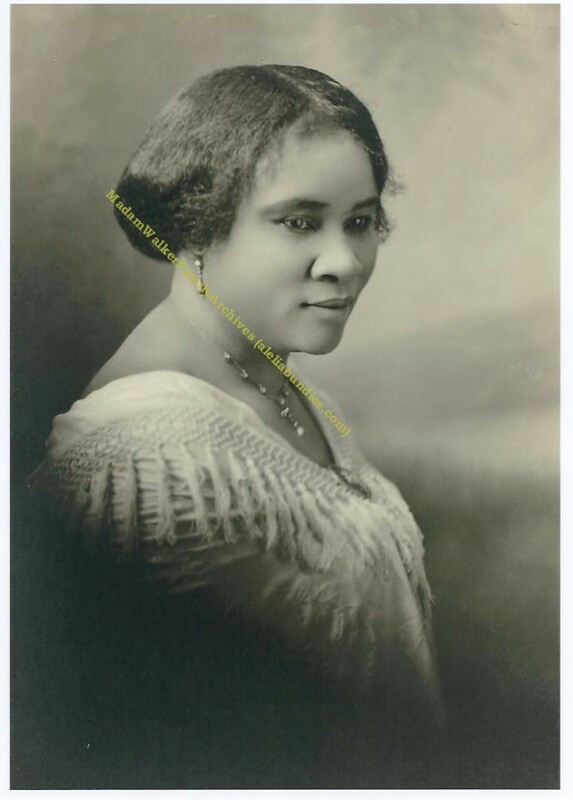 Sarah Breedlove–who later would become known to the world as Madam C. J. Walker–was born on December 23, 1867, just two days before Christmas. The year had been a particularly difficult one for her parents, Owen and Minerva Anderson Breedlove, who struggled to farm the land as sharecroppers on the same Delta, Louisiana planation where they had been enslaved. That their first child to be born free after the Emancipation Proclamation should also enter the world during the Christmas season was a double blessing. But the blessings soon turned to tragedy. Orphaned at seven, married at 14, widowed at 20 with a two year old daughter, it seemed that Sarah Breedlove McWilliams was destined to remain a poor, uneducated washerwoman. Her decision in 1888 to move to St. Louis–where her brothers had become barbers–would be the catalyst that forever transformed her life. As a member of St. Paul African Methodist Episcopal Church, she was exposed to educated black woman who helped her begin to envision better life for herself and her child, Lelia. By the time, Madam Walker died in May 1919 at her Irvington, New York estate, she had become a millionaire and a pioneer of the modern hair care industry along with women like Helena Rubenstein, Elizabeth Arden and Annie Malone, her fierest competitor. Equally as important, she provided employment and entrepreneurial opportunities for thousands of African American women who otherwise would have been maids, laundresses and sharecroppers. In 1917, Walker hosted a national convention of her sales agents in Philadelphia. She used her wealth and influence as a philanthropist, a patron of the arts and a political activist by supporting black colleges, commissioning the work of black artists and musicians, and pledging $5000 to the NAACP’s anti-lynching campaign. Today Walker’s family carries on her legacy through the Madam Walker/A’Lelia Walker Family Archives, the world’s largest private collection of Walker photographs, letters, business records, clothing, furniture and personal artifacts. 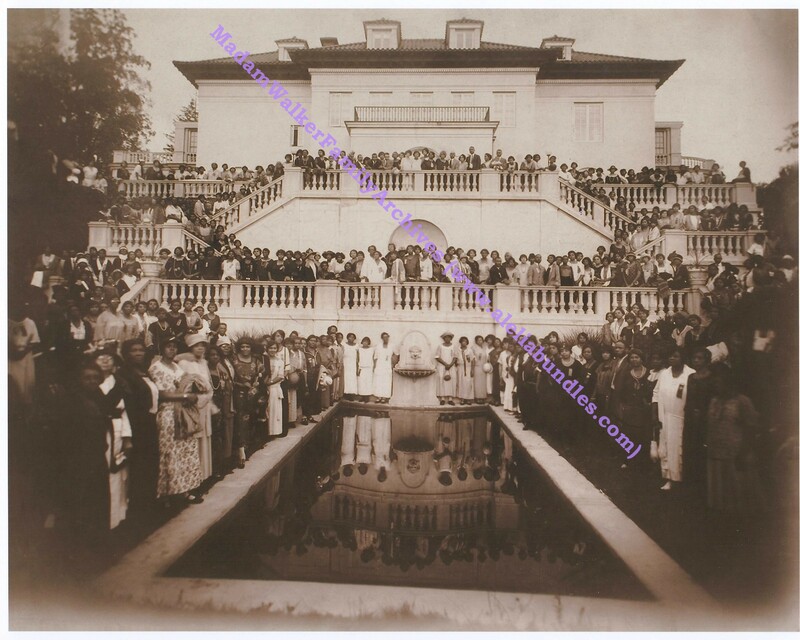 The family also remains involved in the preservation of two National Historic Landmarks: the Madam Walker Theatre Center--a cultural arts venue in Indianapolis–and Villa Lewaro–the Irvington-on-Hudson, New York mansion designed for Madam Walker by architect Vertner Tandy. Walker’s daughter, who would come to be known as A’Lelia Walker, was a central figure of the Harlem Renaissance. Poet Langston Hughes called her the “joy goddess of Harlem’s 1920s” because of the the fabulous parties and the cultural salon she hosted. For more information about Madam Walker, visit the official Walker biography website at www.madamcjwalker.com and read the brief biography. Students who are writing reports will find the student study guide helpful. 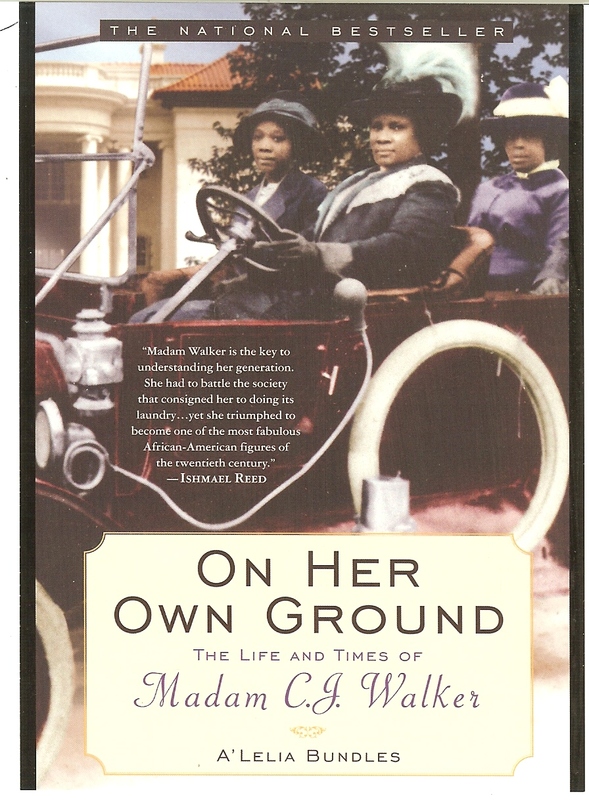 On Her Own Ground: The Life and Times of Madam C. J. Walker–written by Walker’s great-great-granddaughter and biographer, A’Lelia Bundles–was a New York Times Notable Book and the recipient of the Association of Black Women Historians’ Letitia Woods Brown Book Prize. “Two Dollars and a Dream”–the award-winning documentary about Walker–was produced by Stanley Nelson, the grandson of Walker’s longtime attorney, and narrated by his sister, journalist Jill Nelson. Here’s a link to an interview with A’Lelia Bundles and to Firelight Media, Nelson’s production company. 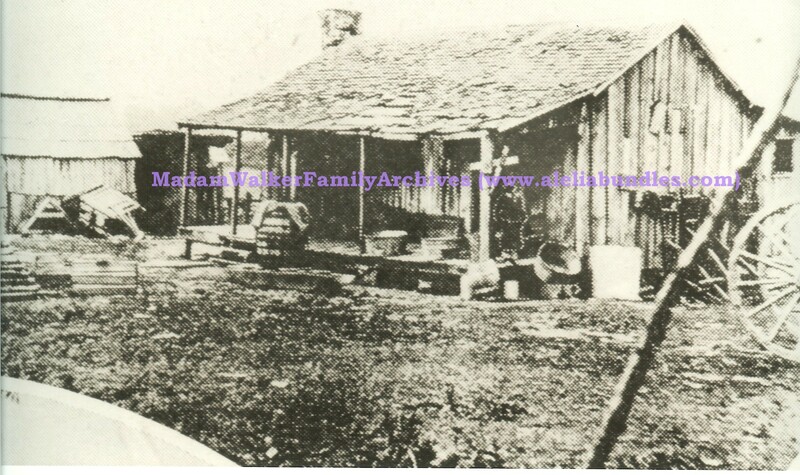 Visit the Madam Walker Family Archives on Facebook and the Official Madam Walker Biography on Facebook. 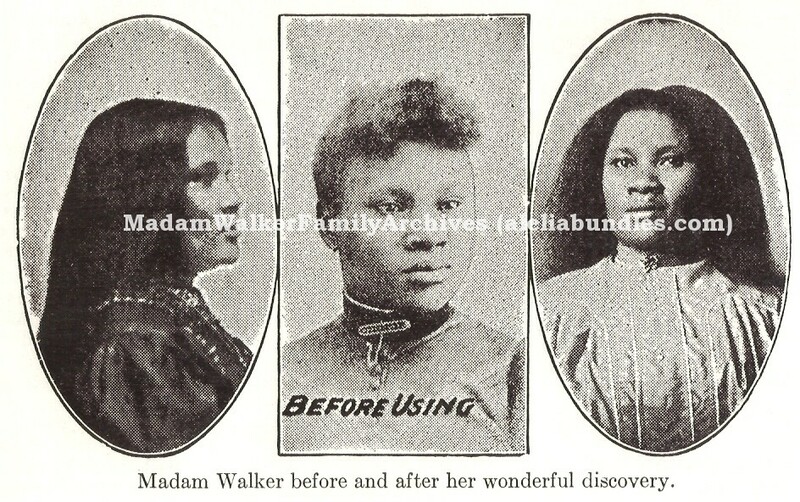 This entry was posted in A'Lelia Bundles, Madam Walker, Madam Walker Family Archives, Madam Walker Photos and tagged A'Lelia Bundles, A'Lelia Walker, Jill Nelson, Madam CJ Walker, Madam Waker Family Archives, Madam Walker Photos, Madame CJ Walker, Stanley Nelson, Two Dollars and a Dream, Villa Lewaro. Bookmark the permalink. 1 Response to Happy 144th Birthday, Madam C. J. Walker! As usual , a wealth of enlightening and self affirming info!